While most coastlines often appear to be stable and permanent over the short time span of our visits, and some are, there are many others where the materials making up the coastal bluffs or cliffs are no match for the forces the sea exerts. Whether the constant rise and fall of the tide and the accompanying wetting and drying, heating and cooling, and exposure to salt water, or the sheer impact of breaking waves, the ocean is a challenging force to resist. Over time, the ocean always wins. In baseball terms, Mother Nature always bats last. So while there are rock types that are very resistant to the impact of the sea, granitic and volcanic rocks, and even certain sedimentary rocks that are high in silica, being several examples, which often form the protruding headlands or points we recognize and give names to, there are others that don’t hold up so well. In addition to the rock types themselves, and differences in their cementation or hardness, there are also often structural weaknesses or irregularities that cut through or penetrate the rocks making up coastal cliff or bluffs. It is typically these weak zones, whether faults, joints, fractures or other features, which the waves seek out and erode, gradually creating tunnels, caves, or natural bridges or arches. The coastline of Santa Cruz County has undergone some dramatic changes over the past century or so of human observation and photography, and watching the waves batter the cliffs during any winter storm makes you realize why. This is a high-energy coast with waves 10-12 feet high arriving regularly. As coastal geologists we often take measurements from old aerial photographs to see how much retreat has taken place over time and then calculate cliff retreat rates. For the much of the Santa Cruz County coastline the average annual erosion rates typically range from a few inches to about a foot/year. Cliff failure doesn’t occur in simple six inch or one-foot increments every year, however. Instead we see large slabs fall to the beach or natural bridges or arches collapse catastrophically. The rocky coast from the city of Santa Cruz north to the old town of Davenport consists of a 30 to 75 foot high uplifted marine terrace, which has been eroded into relatively young sedimentary rocks, a mix of sandstones, siltstones and mudstones. These rocks vary in their resistance to erosion and also have been weakened over hundreds of thousands of years of stress within the San Andreas Fault system and also from exposure to waves, salt air, and gravity. There have been a large number of picturesque natural bridges that were often photographed by earlier visitors, which preserved a permanent record for what was here and how the coastline has changed. Several years ago we published a book comparing old photographs of the Santa Cruz coast, many taken 75 to 100 years ago, with photographs we took from the same locations in 2006 (The Santa Cruz Coast-Then and Now). The natural bridges or arches fascinated early visitors as they do today, but the same rock weaknesses that allowed the waves to erode those arches, have also led to their demise. Natural Bridges State Beach is perhaps the best known and the progressive loss of two of the three bridges, one in about 1905, and the second during a storm on the night of January 10, 1980. Today only a single bridge remains. While some natural bridges may last a century or more, others have appeared and disappeared within a few decades. One section of terraced cliff I photographed four miles north of Santa Cruz in 1969 showed a prominent point eroded into mudstone, but no arch. By 1987, an arch had formed where wave erosion had attacked a weak layer at the base of the point. By 1995 the entire arch and point had completely collapsed. A century ago a large natural bridge spanned the entrance to cove along the coastline that formerly was a dairy farm and ranch, but today is Wilder Ranch State Park. 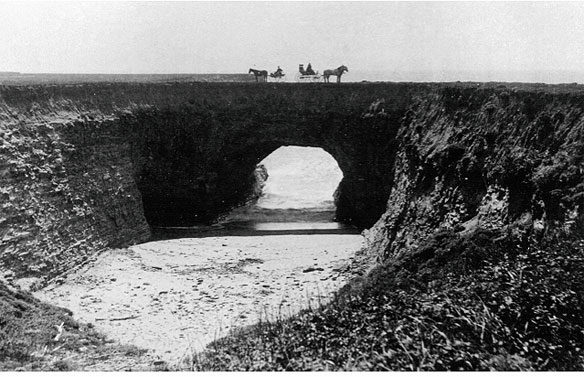 This arch was photographed in about 1900 with not one, but two horses and buggies, perched on top of it. This wasn’t a delicate arch, but a pretty meaty natural bridge that the buggy drivers clearly had some confidence in. Based on historic aerial photographs, this grand arch collapsed somewhere between 1928 and 1943. Closer to the city of Santa Cruz, along the oceanfront street, West Cliff Drive, there was a triple arch for a while, which was a popular site for photographs in the late 1800’s and early 1900’s. Part of this arch ultimately collapsed, leaving the famous Vue de L’eau, a picturesque single arch memorialized on many old postcards. This bridge was also known as Arch Rock and also Crown Arch (for a while it had a cap or crown of weaker terrace deposits). Lots of old photographs and postcards of Crown Arch remain, and as the years progress you can see the crown disappear, the arch gradually thin, and finally sometime in the 1920’s, it all collapsed. The east side of Lighthouse Point, known globally as a famous surfing spot, Steamer Lane, was the site of another arch where photographs of ladies in long Victorian dresses and strange hats were often taken. A large storm in the winter of 1888 finally brought down the arch, but its base still stands in shallow water today, directly in front of the stairway where surfers heading to Steamer Lane enter the water. Lighthouse Point is now partially undermined by two separate caves, which in time will collapse, perhaps leaving new arches for the photographers of the future. A combination of the degree of cementation or consolidation of the rocks at each of these points that provide their variable strengths and resistance to wave erosion, but internal structural weaknesses such as joints and fractures also play a role. The Natural Bridges of Santa Cruz County will continue to form and then collapse as the ocean takes its toll on the coastline.